Chevy’s small car is big on efficiency. Car sales are getting clobbered in a market where SUVs and pickup truck growth continues to expand. Even as we finish yet another strong sales year, manufacturers are shifting production capacity away from cars in favor of the vehicle types consumers want. Yet, brands such as Toyota, Ford, Hyundai, Honda, Chevrolet, Volkswagen, Nissan, Kia, and Mazda are not retreating from segments that have long provided a logical entry point to each brand. Indeed, both subcompact and compact cars afford a sensible gateway for manufacturers, enticing consumers to buy new and, hopefully, win their continued allegiance for decades to come. The 2017 Chevrolet Cruze is a compact model, originally available as a sedan since its 2011 US release, but is now supplemented by a hatchback and will soon offer a diesel variant. Both changes could reverse a recent slide in sales, one that saw double-digit losses throughout the 2016 calendar year. 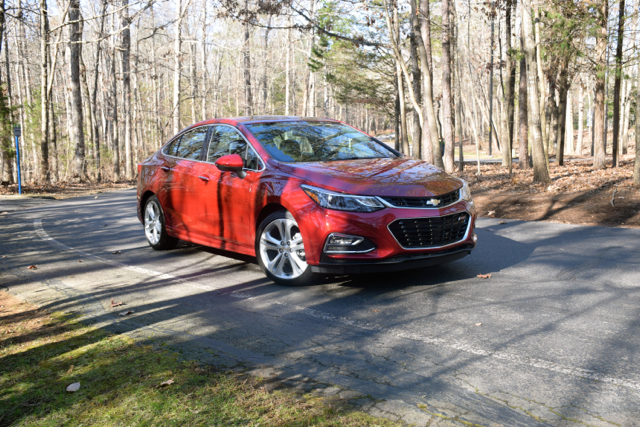 Some of that drop can be attributed to a shift in customer tastes, while a case can also be made for customers opting for the midsize and vastly improved Malibu sedan. Chevrolet offers the 2017 Cruze sedan in L ($17,850), LS ($19,400), LT ($21,025), and Premier ($24,350) grades. The hatchback is offered in just two grades: LT ($22,115) and Premier ($24,350). All L, LS, and LT models come with a six-speed manual transmission; add approximately $1,000 for the automatic (not offered with the L). Prices include a $875 destination charge. 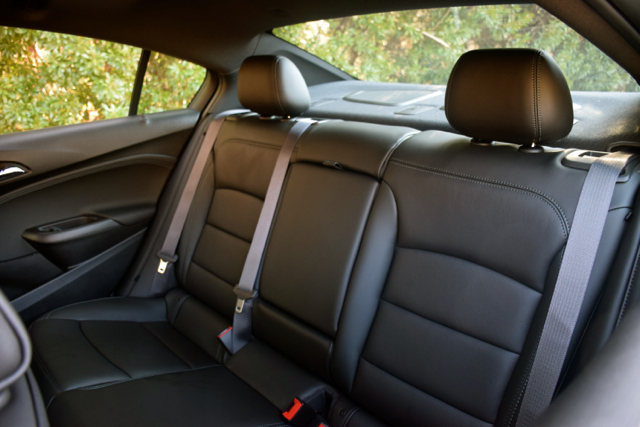 The Cruze LS offers a pair of packages — interior protection ($200) and ground effects ($1,495). Both LT grades offer a convenience package, an $850 upgrade. Add $230 for a chrome appearance package. Further, LT and Premier customers can choose an RS package ($695 in the LT and $995 in the Premier). The Premier grade also offers an $865 enhanced convenience package (e.g., heated rear outboard seats, wireless charging for devices, a 110-volt outlet); a $1,995 sun and sound with navigation package (e.g., power sliding sunroof, 9-speaker Bose audio system, Chevrolet MyLink with navigation, and advanced instrumentation); and a $795 driver confidence package (e.g., automatic headlamps with high beam detection, rear park assist, forward collision alert, and other safety features). So, which body style should you choose? To be fair, my review vehicle was the Premier sedan, so I can tell you only about that body style. That said, both models sit on a 106.3-inch wheelbase and that means there is ample room inside. From bumper to bumper, the sedan measures 183.7 inches; the hatchback comes in at 175.3 inches. The sedan’s trunk measures upwards of 14.8 cubic feet, while the hatchback offers 24.7 cubic feet behind the rear seat or 47.2 cubic feet with the rear seat folded. The 2017 Cruze sedan offers a sleek appearance with a lower grille larger than that of the upper grille. Body sculpting is evident around the available fog lamps, across the hood, and along the profile. That profile features a rising belt line and standard steel wheels. Alloy wheels are available. To the rear, you’ll find wraparound combination lamps, additional sculpting, and diffuser-like trim. Beyond the available alloy wheels, optional equipment includes a sport body kit, LED daytime running lamps, fog lamps, and a rear spoiler. All-season tires are standard across the model line. Wheel sizes range from 15 to 18 inches; machined wheels with high-gloss black pockets are now available — 18-inch size only. Other equipment available includes power-folding and heated side mirrors. 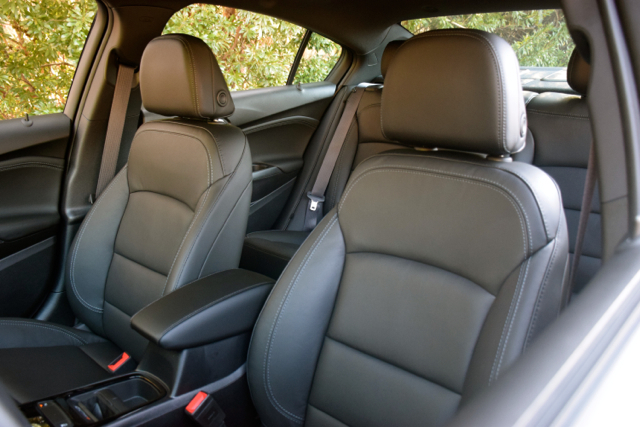 With 42 inches of legroom, the Cruze offers midsize cabin space up front. To the rear, you’ll find 36 inches of legroom, which is about average for the segment. This front-wheel drive model seats five, although it is best used by four. Swoopy lines dominate the dashboard with the instrument panel composed of two large and two small analog displays along with a digital driver’s information center. Standard cloth seats give way to leather seats in the Premier. Standard equipment includes keyless entry, power windows and door locks, a tilt and telescopic steering column, and air conditioning. Also available is push-button start, automatic climate control, cruise control, a rear center fold-down armrest with a pair of cup holders, dual reading lights, a remote vehicle starter system, a power driver’s seat, and heated seats. A leather-wrapped steering wheel, heated steering wheel, and illuminated visors are also available. 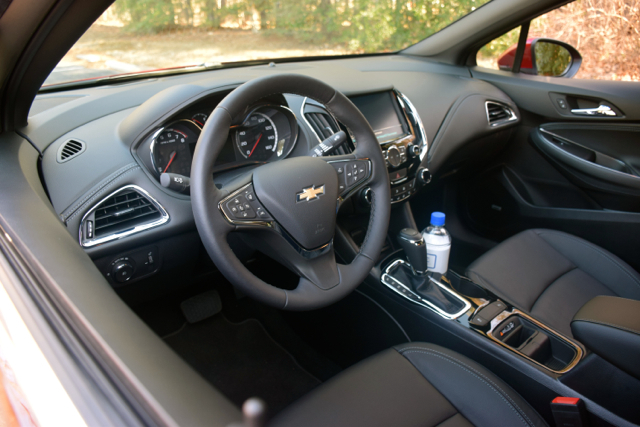 The Chevrolet MyLink infotainment system is standard across the Cruze line. The audio system is comprised of a seven-inch color touchscreen with Bluetooth music streaming and Apple CarPlay and Android Auto compatibility. All models come with a USB port and OnStar with 4GT LTE Wi-Fi. Navigation and various audio packages comprised of four, six, and nine speakers are available. 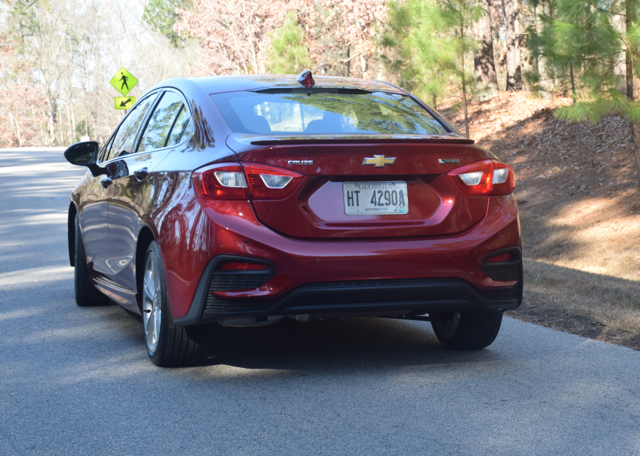 On the safety front, the Insurance Institute for Highway Safety has conducted only partial tests thus far on the 2017 Cruze. The sedan achieved top scores of “good” in two categories: moderate overlap front and side. The IIHS also acknowledged the sedan’s available, but basic, front crash prevention system. The National Highway Traffic Safety Administration (NHTSA) has yet to rate the 2017 Cruze, but the federal agency awarded the similar 2016 model with its top five-star crash test rating. All models are equipped with 10 airbags, a rearview camera, and the usual stability and traction control technologies. As of this writing, there is only one engine choice with the 2017 Cruze: a 1.4-liter turbocharged four-cylinder gas engine. Making 153 horsepower and 177 pound-feet of torque, this engine will be joined by a turbo diesel this spring. The gas engine offers excellent fuel economy, delivering as high as 30 mpg in the city and 40 mpg on the highway in some models. These numbers are at the upper end of the fuel economy range and are achieved with the six-speed automatic transmission. Stay with the standard six-speed manual gearbox and your model will make upwards of 28 mpg in the city and 39 mpg on the highway. As for the diesel, it’ll displace at 1.6 liters compared with the 2.0-liter turbo-diesel offered earlier. This means that the new engine should better the previous four banger’s 44 mpg on the highway. No word about performance numbers, but we’re expecting some significant torque. Even with the diesel, Chevrolet has ignored not just the performance side of the house, but consumers wanting something more than the base engine. While the base engine gets the job done, it is slow off the mark and just lacks the oomph customers may be expecting. 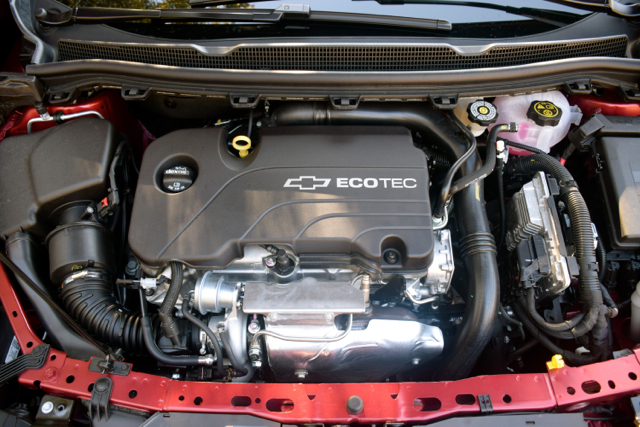 A normally aspirated 2.0-liter gasoline engine or something slightly larger would be ideal, but Chevrolet isn’t offering it. 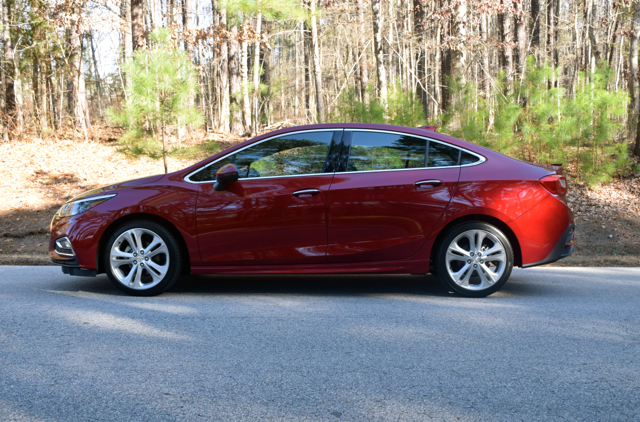 I give the Cruze high marks in several areas, including its quiet cabin, relatively smooth ride, and decent handling. There isn’t anything exciting about this car’s drive, but at least its stellar fuel economy and nicely laid out interior are strong attributes. Move away from the base “L” model and you’ll find a well-equipped little sedan or hatchback for your consideration. The Chevrolet Cruze checks off some of the boxes shoppers want, including value, efficiency, and technology. However, its weakest point is performance, with only one gasoline engine offered. In effect, Chevrolet has decided not to challenge the likes of the Ford Focus ST, Volkswagen Golf GTI, or the Subaru WRX by offering an SS variant with a more powerful engine paired with a short-throw manual gearbox and tied in with a sport suspension. That said, two new features will only help make a case for the Cruze. 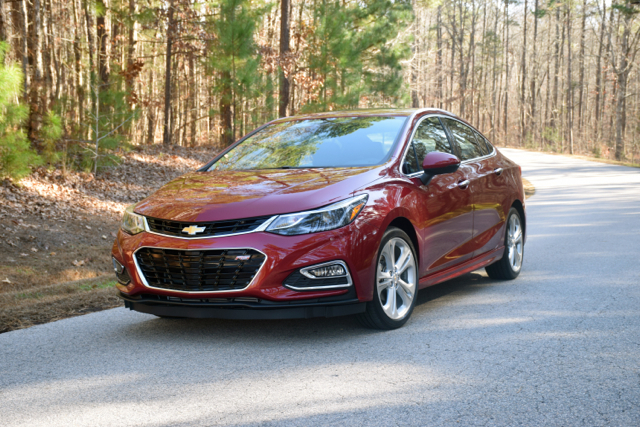 Adding a hatchback enables Chevrolet to challenge the Focus as well as give customers an alternative to the Mazda3, Volkswagen Golf, and the Kia Forte5, among others. And by offering a diesel option this spring, Chevrolet fills a void left by Volkswagen when the German automaker had to pull its engine from the market following an emissions scandal of its own making. All in all, the Chevrolet Cruze is light years ahead of every small Chevy offered previously. That fact alone makes the Cruze a model to put on your small car shopping list. See Also — Is the Ford Focus RS the Best Small Car in the World?